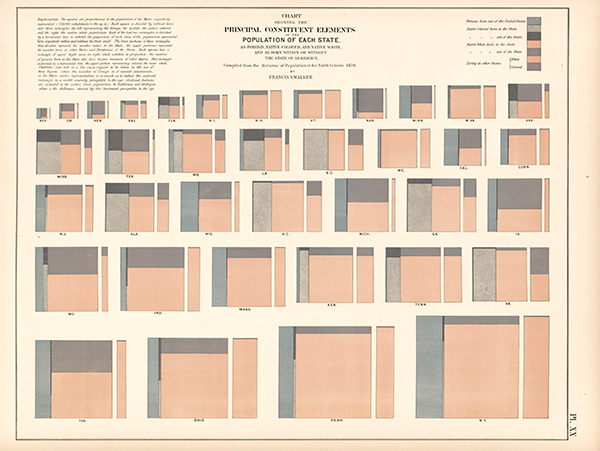 The Statistical Atlases of the United States are rich with information on the historical population of the United States. FRASER has the entire run of the Statistical Atlases, which cover data from the 1870, 1880, 1890, 1900, 1910, 1920, 1970, and 2000 censuses. As expected of an atlas, each publication displays data primarily through various maps. However, you may not know that alongside these maps are charts and graphs that also show demographic data. The design of these charts varies across the publications. Some charts, such as common pie or bar charts, will look familiar, but others will require some critical thinking in order to interpret. The chart above shows data in two ways. It shows the ranking of populous cities at any particular point in time, as well as a specific city’s ranking change over time if you follow that city’s individual line. Something to note is that the data shown here is in reverse chronological order. 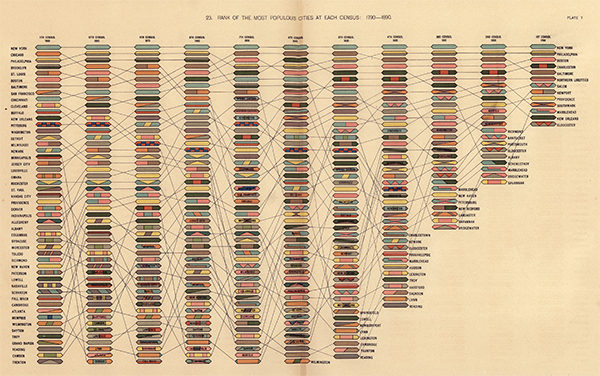 Here is another example of an unusual chart from the 1870 Atlas. 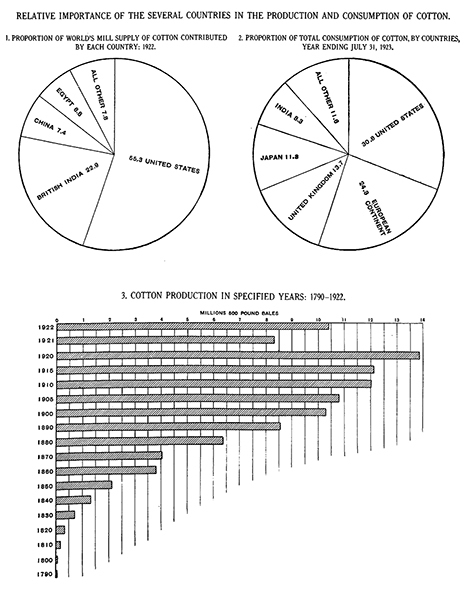 At first glance, this chart from 1870 may be hard to interpret. For this reason the authors included quite a significant explanation in the top left corner of the plate. Instead of showing numerical data, this chart shows its data comparatively using size. Now because this is a digital scan, it is much more difficult to get an exact number for the African-American population of Florida, for example. However you can see that Florida’s ratio of African-American residents compared with other races is similar to Alabama’s. In contrast, there are also charts that are very straightforward. These charts from the 1920 Atlas are much simpler to read, even if they aren’t necessarily the most eye catching. From this we can surmise that data representation in the 1920 Atlas began to focus more on displaying data as clearly as possible. The charts here are more in line with something one might see today. What this means is that historical materials can be trickier to interpret the further back in time we go. Data can be displayed in various ways in order to make the given information more potent—and more interesting to look at! If you’re interested in additional information about the use and interpretation of historical data visualization, the Historical Inquiry with Charts Toolkit (designed by the economic education staff of the St. Louis Fed) is great for teaching students how to critically look at charts in order to understand their historical context.